In an area dominated by canfields, the runway at Tower Hill doesn't look like much, just a strip of clear earth in an abundance of green. "Since the new board has taken over we have done a new strategic plan as to where we want not only in Orange Walk but across this country to say where we are and where we want to go. Orange Walk was a strategic place because that is the next place that needs to develop." "We have a big tourist industry in Orange Walk that is developing right now on a day to day basis. We have the trps that go to Lamanai, very famous - people come already pre-booked when they reach to Belize to visit Lamanai and to reach to Lamanai they come through the airstrip. Now, the present condition of the airstrip doesn't allow for planes to land at all times because of the condition, especially a little rain, the plane cannot land and therefore a lot of these cancellations that are taking place." "I was talking to the minister earlier, Minister of Tourism and he is saying that the growth that this runway is showing is much greater than the runway at Ranchito showed at the stage that this is. I am certain that we will get a lot of economic benefit it. Just Lamanai, like when we have the busses parking at what use to be Jim School pool, everybody still remembers that - it's incredible and a lot of people don't like to come to Belize City from San Pedro then catch the bus and then come to Orange Walk, so these types of tourists will start making use of this runway." "Likewise our Belizean people, our Orange Walkenos, who live and work in San Pedro - a lot of these people traverse on a day to day basis. A lot of people have to fly to Ranchito etc. and then end up in Orange Walk. We are going to change that around." "Are you able to assure us that there was a competitive bidding process because we see Imer Hernandez and he gets pretty much every job in the north." "I figure that this would come around because I see his name appearing like you said. But be that as it may from a very competitive process he was the best in terms of price and we know his track record - he has a quality track record." "But it seems, just from an outsider perspective that every public works contract in the Orange Walk District ends up with Imer Hernandez. Is this because he is a relative of yours?" "I think him being my relative most naturally helps, but not just because he is my relative he is getting the job. I am certain that he gets the job because he has the capacity; he has proven to be able to deliver good work. It's as simple as that." "Are the people who issue the contracts compel to choose him, is there is a competitive process or is there a directive that says that you all have to give this job to Imer because this is in my back yard?" "No, not really. I had nothing to do with this. This is completely out of my reach. Jules, I just want to tell you that no matter what happens, people will make their own conclusion. All I am saying is that I don't have anything to do with it. You have Berber and Lopez who can't finish a job to Yo Creek - who can't finish the job in Progresso, San Estevan - nobody speaks about that. 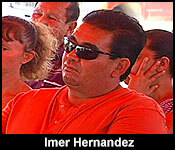 They subcontract Imer to do some work for him; it must be that he is doing good work." This contract is for 764 thousand dollars, and the work will start on Monday. It should take four weeks - during which time the airstrip will be closed. "It was going to be done by chip and seal that would have cost much less, the thing about that it only lasts 5 to 7 years the most. Chip and seal is almost outdated now, you got to go either concrete or you go hot mix and with a couple hundred dollars more we decided that we will go hot mix with that. This will be there for at least 15 or so years." Presently, Tropic Air has two scheduled flights to Tower Hill, Orange Walk. The Airports Authority hopes to increase that. The runway is located just about a mile away from the BSI factory. That's sugar country, but western Orange Walk is also known for drug flights. Today we asked a man uniquely equipped to weight those considerations - Elodio Aragon - about it. He's the former Deputy Commissioner of police - and we asked him if it is a security rise:..
"Might this airstrip used for illicit purposes?" "Definitely that will always be a concern for any airstrip. But I am sure that the Belize Airport Authorities will be putting the mechanism to ensure that we keep that at a no. Definitely this airstrip has been here, if anybody wanted to deal with it illegally they'll have to take the risk and they could have been doing it many times. The fact is that as far as I know from when I was in the police department and being here on the ground that has not been the case." The airstrip will be close for four weeks while construction is underway - that timeline of course depends on when the heavy rains arrive. Ground was broken today marking the start of rehabilitation works on the airstrip located in the Tower Hill Area of Orange Walk town. Belize Airport Authority executives flanked by other government officials announced that the upgrade of the airstrip is part of the larger plan of the Belize Airport Authority to upgrade all airstrips across the country bringing them up to international standards. This particular airstrip has been in operation since 2011 and while it sits in a remote area, a few miles before reaching Chan Pine Ridge Village, there has been an increase in air traffic recently. Tourists are the ones primarily using this route to get to Corozal and Chetumal faster. The estimated cost of the upgrade is seven hundred and forty nine thousand dollars and it should be completed in four weeks time, that is if the weather permits. Minister of Tourism Manuel Heredia says the upgrade will benefit the tourism industry and Orange Walk on a whole. 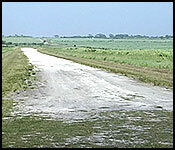 Observers believe that the Tower Hill airstrip has seen more traffic than the airstrip in Ranchito, Corozal District. In June we showed you the ground breaking for the Tower Hill Airstrip in Orange Walk – and now they're getting ready to officially open the refurbished runway. And it is quite a transformation from a scratch of rough cement to a fully paved strip. The airstrip is ideally located to get tourists get to Lamanai, which is close by. The runway is located just about a mile away from the BSI factory and is now fully operational. This morning, Minister of Tourism, Culture & Civil Aviation Hon. Manuel Heredia Jr. announced during the inauguration of the newly renovated Chan Pine Ridge Airstrip that the airstrip has been named in the honour of the late Ambassador H.E. Alfredo Martinez. Ambassador Martinez was posthumously awarded the Order of Belize - the highest order - at the September 2014 Tribute to Belizean Patriots. He served the people and Government of Belize in numerous diplomatic capacities, his last being as Ambassador of Belize to Guatemala. The unveiling of the newly renovated airstrip located at the Tower Hill/Chan Pine Ridge road was officially inaugurated today. The once white marled, dilapidated stretch was the only transit point for air arrivals to Orange Walk and whilst the numbers of tourist arrivals to our shores are steadily increasing, the need for an internationally accepted standard airstrip was pertinent. Today among several government dignitaries, BTB officials and members of the Belize Airports Authority, the newly upgraded airstrip and its name change was unveiled today. Minister of Tourism and Civil Aviation, Manuel Heredia, told the congregate that the airstrip will serve to promote and expand the local capacity of tourist arrivals, thus improving the economy and benefiting the north. 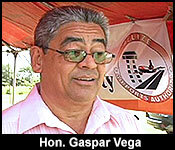 Heredia announced today that the airstrip has been renamed to the His Excellency Fred Martinez Chan Pine Ridge Airstrip. Since 2009, over 6 years, the Government of Belize has been actively engaged in an airport development program of aerodromes countrywide. 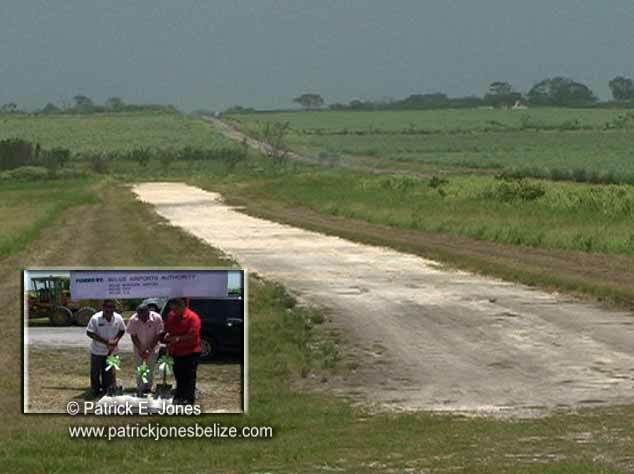 To date, over 6 million Belize dollars have been invested in the improvement and development of airstrips across Belize. This 1.2 million dollar project was funded by the Government of Belize and the Belize Airports Authority. The unveiling of the newly renovated and renamed Tower Hill/Chan Pine Ridge Airstrip took place yesterday onsite on the Tower Hill/Chan Pine Ridge Road in the Orange Walk District. The once white marled and decrepit pavement, which serves as the only transit point for air arrivals to Orange Walk Town, was also renamed after one of the most prominent natives of “Sugar City”, former Mayor of Orange Walk, and the late Ambassador to Guatemala, Alfredo “Fred” Martinez. Yesterday at the official ceremony, Minister of Tourism, Manuel Heredia Jr., in addressing the audience of government dignitaries, Belize Tourism Board (BTB) officials and members of the Belize Airports Authority (BAA), spoke about the airstrip and the fitting reason for its name change. 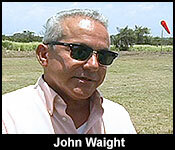 “This airstrip will be renamed to suit the vigor, the dynamism, the humble eloquence and pride of Orange Walk. From this moment forward, this will be called the Alfredo Martinez Chan Pine Ridge Airstrip. This is in commemoration of the life of one of Orange Walk’s most astute and celebrated sons, and one of Belize’s renowned diplomatic giants. Ambassador Martinez relentlessly championed Belize’s sovereignty and economic independence, and for that, it shall remain forever indebted to his legacy and to his family who are here with us this morning”, Heredia announced. 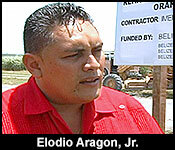 Elodio Aragon, Jr., the UDP standard bearer for Orange Walk East, who also sits on the BAA Board of Directors, mentioned that since it has now been repaved with hot mix and painted to international standards, the airstrip will go a long way to improve the safety of all those who use it. 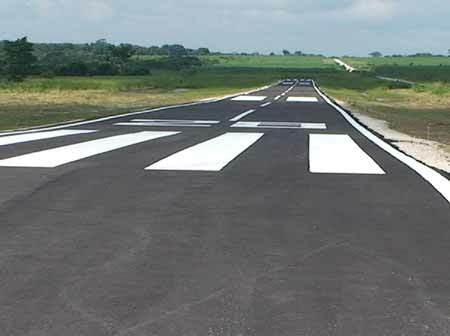 The physical layout comprises 2,300 feet of runway, and the project’s cost, as was mentioned, was over $1.2 million. Since 2009, the Government of Belize (GOB) has been engaged in an airport development program of aerodromes countrywide. 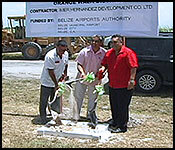 To date, over BZ$6 million has reportedly been invested in the enhancement of airstrips across Belize. 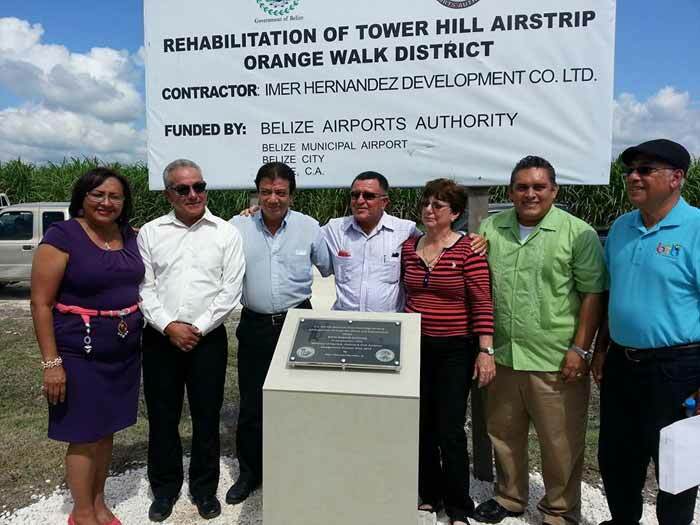 The project was funded by GOB and the Belize Airports Authority. Looks good. It is on our list to visit on our trip in February. Any suggestions on local access (taxis?) if we fly in? is there a ramp off to the side to park for the day?